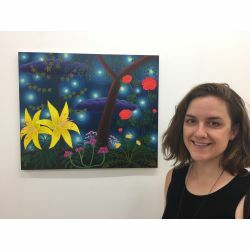 Amy Lincoln is a New York-based artist whose paintings depict plants, the natural world, indoor and outdoor spaces and people. She had her solo exhibitions in art galleries such as Morgan Lehman Gallery in New York, One River School in Larchmont and Monya Rowe Gallery in Saint Augustine, Florida. She received her Master of Fine Art from Tyler School of Art in Philadelphia and her Bachelor of Art from the University of California, Davis. She has participated in the Wave Hill Winter Workspace program in NYC as well as the Inside Out Art Museum artist residency in Beijing. Lincoln moved to New York in 2006 upon receiving a Swing Space residency from the Lower Manhattan Cultural Council. She, her husband artist Kevin Curran, and their daughter Fiona currently live in Brooklyn, NY.